In this work, a previously-developed, statistical-based, damage-detection approach was validated for its ability to autonomously detect damage in bridges. The damage-detection approach uses statistical differences in the actual and predicted behavior of the bridge caused under a subset of ambient trucks. The predicted behavior is derived from a statistics-based model trained with field data from the undamaged bridge (not a finite element model). The differences between actual and predicted responses, called residuals, are then used to construct control charts, which compare undamaged and damaged structure data. 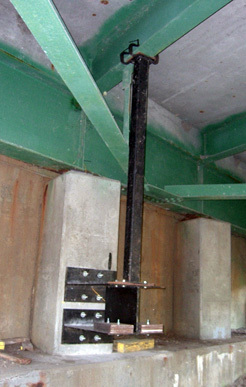 Validation of the damage-detection approach was achieved by using sacrificial specimens that were mounted to the bridge and exposed to ambient traffic loads and which simulated actual damage-sensitive locations. Different damage types and levels were introduced to the sacrificial specimens to study the sensitivity and applicability. The damage-detection algorithm was able to identify damage, but it also had a high false-positive rate. An evaluation of the sub-components of the damage-detection methodology and methods was completed for the purpose of improving the approach. Several of the underlying assumptions within the algorithm were being violated, which was the source of the false-positives. Furthermore, the lack of an automatic evaluation process was thought to potentially be an impediment to widespread use. Recommendations for the improvement of the methodology were developed and preliminarily evaluated. These recommendations are believed to improve the efficacy of the damage-detection approach.